Inclusionary/Exclusionary Criteria: All veterans served in a foreign country at some point during their military careers and demonstrated a confirmed diagnosis of Post-Traumatic Stress Disorder (PTSD). Dual diagnosis of PTSD/traumatic brain injury (n = 27; 39%) or PTSD/major depressive disorder (n = 40; 58%) was permitted due to the high co-morbidity rates of these psychopathologies; however, veterans were excluded on the basis of substance abuse disorders or any other Axis II diagnosis from the Diagnostic and Statistical Manual (IV). Of the 69 veterans, 55 (80%) identified themselves as Caucasian, and 57 (83%) reported education beyond a high school diploma or equivalent. Most of the veterans served in the U.S. Army (n = 42; 61%), with the remaining veterans having served in the Marines (n = 17; 25%), Navy (n = 7; 10%), U.S. Army National Guard (n = 2; 3%), or Air Force (n = 1; 1%). Multivariate repeated measures analyses of variance (MANOVA’s) with Bonferroni post hoc analyses evaluated significant changes in mood states, depression, anxiety, and somatic stress across the three time periods of assessment. Mood was measured using the Positive Affect and Negative Affect Schedule, a commonly used inventory that assesses mood states experienced in the past week. The Brief Symptom Inventory was used to assess depression, anxiety, and somatic stress in the past week. The inventories corresponding to perceptual stress (Perceptual Stress Scale), PTSD symptoms (PTSD Checklist, Military Version), and sleep quality (Pittsburgh Sleep Quality Inventory) pertain to self reported experiences from the past month, and so were administered at the baseline and follow up assessment periods. For all three inventories, lower scores reflect improvement: less stress, fewer PTSD symptoms, and enhanced sleep quality, respectively. Paired sample T-tests were used to assess significant reductions on these measures between the baseline and follow up periods. We hypothesized that participation in the fly fishing retreat would be linked to significant and sustained improvement in psychosocial well being, as evidenced in improved mood states and sleep quality, and reduced depression, anxiety, and PTSD symptoms. Question: Is the fly fishing retreat linked to significant improvement in perceptual stress, PTSD symptoms, and sleep quality? Perceptual Stress: t(50) = 5.04, p < .001; PSS scores displayed a significant reduction from Baseline (M = 23.27, SD = 6.57) to Follow Up (M = 18.75, SD = 7.13), representing a 19% reduction from the baseline score. PTSD Symptoms: t(49) = 6.66, p < .001; PTSD scores displayed a significant reduction from Baseline (M = 60.29, SD = 13.78) to Follow Up (M = 48.78, SD = 15.24), representing a 19% reduction in PTSD symptoms. Sleep Quality: t(50) = 3.23, p = .002; PSQI scores showed a significant reduction from Baseline (M = 12.82, SD = 3.57) to Follow Up (M = 11.41, SD = 4.01), representing a 11% reduction from the baseline sleep quality score. Given the fact of the matter that the observed changes on these inventories pertaining to important variables of psychosocial functioning appear to be reliant upon a brief outdoor recreation intervention among other combat vets with PTSD, these findings may be regarded as quite encouraging. Keeping in mind that these veterans have all been diagnosed with PTSD and most of them have a longstanding history of prescribed pharmacologic treatments for their conditions, these results represent therapeutic shifts that extend beyond any improvements observed by some of the more traditional treatment interventions amid this population. Further, a score of 50 on the PTSD check list is regarded as a clinically significant value, so the approximately 20% reduction in PTSD symptoms as reflected by this inventory dips below the clinical range. Finally, these scales are predictive of health outcome overtime, so the significant findings may be regarded as having meaningful implications that merit replication in a larger investigation involving a randomized control group design. Question: Is the fly fishing retreat linked to significant reductions in Anxiety, Depression, and Somatic Symptoms of Stress as measured through the Brief Symptom Inventory? Figure 1.0. 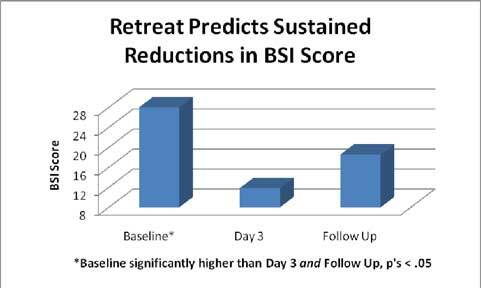 This figure illustrates signficant and sustained reductions in overall BSI score: Baseline (M = 28.51, SD = 14.18); Day 3 (M = 11.82, SD = 11.27; 59% reduction from baseline); and Follow Up (M = 18.55, SD = 12.4; 35% reduction from baseline). Figure 2.0. This figure depicts the BSI Subscale results. First, the fly fishing trip was linked to signficant and sustained reductions in somatic stress (e.g., faintness, chest pains, nausea) from baseline (M = 7.1, SD = 5.3) to Day 3 (M = 4.23, SD = 4.47; 40% reduction from baseline) and the follow up assessment (M = 5.12, SD = 4.43; 28% reduction from baseline). 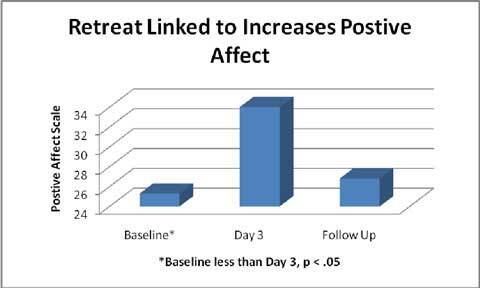 Significant reductions were also observed for both depression (e.g., feelings of worthlessness, hopelessness, suicidal ideation) and anxiety (e.g., nervous, tense, panic) from baseline to Day 3 and the follow up assessment (Depression scores displayed a 73% reduction at Day 3 and a 44% reduction at Follow Up: Baseline M = 10.57, SD = 5.58 to Day 3 M = 2.9, SD = 4.03 to Follow Up M = 5.9, SD = 4.69; Anxiety scores showed a 57% reduction at Day 3 and a 31% reduction at Follow Up: Baseline M = 10.86, SD = 5.72 to Day 3 M = 4.69, SD = 4.47 to Follow Up M = 7.53, SD = 5.04). These findings suggest that this brief fly fishing excursion amid peers is linked to significant reductions in depression, anxiety and somatic stress, effects that endure to a 1 month follow up assessment. Question: Is the fly fishing retreat predictive of significant reductions in negative mood states? Figure 3.0. 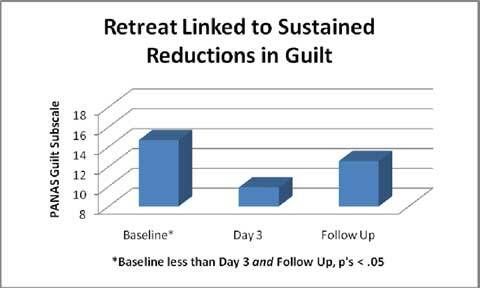 Encouraging results reveal significant and sustained reductions in feelings of guilt (e.g., ashamed, blameworthy, angry at self) from baseline (M = 14.67, SD = 6.0) to Day 3 (M = 9.91, SD = 5.03; 32% reduction from baseline) and the follow up assessment (M = 12.55, SD = 5.66; 14% reduction from baseline). Figure 4.0. Results indicated fly fishing trip linked to an acute significant reduction in reports of hostility (e.g., scornful, irritable, loathing) from baseline (M = 16.88, SD = 5.32) to Day 3 (M = 9.69, SD = 4.35; 43% reduction from baseline) and follow up (M =14.20, SD =4.94; 16% reduction from baseline). Figure 5.0. 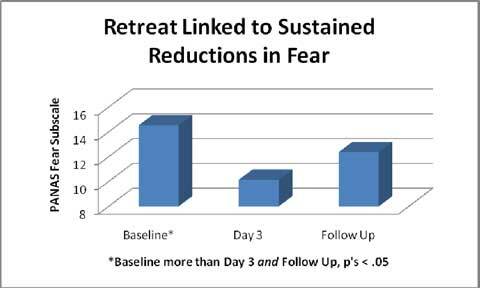 Results indicated fly fishing trip linked to an acute significant reduction in reports of fear (e.g., afraid, shaky, scared) from baseline (M = 14.53, SD = 5.48) to Day 3 (M = 10.14, SD = 4.71; 30% reduction from baseline) and follow up (M = 12.37, SD = 4.79; 15% reduction from baseline). Figure 6.0. 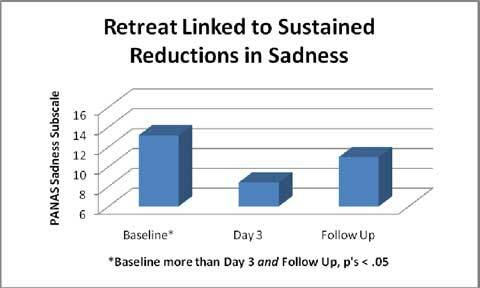 Results revealed the fly fishing trip to be linked to significant reductions in feelings of sadness (e.g., alone, blue, downhearted) from baseline (M = 13.16, SD = 5.04) to Day 3 (M = 8.41, SD = 4.02; 36% reduction from baseline) and follow up (M = 10.96, SD =4.24; 17% reduction from baseline). Figure 7.0. 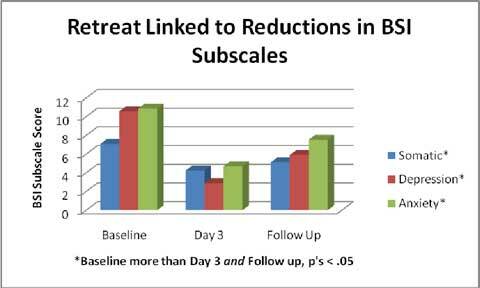 Results indicated significant reductions in negative affect (e.g., upset, nervous, jittery) from baseline (M = 26.33, SD = 7.77) to Day 3 (M = 16.61, SD = 7.69; 42% reduction from baseline) and follow up (M = 22.63, SD = 7.41; 14% reduction from baseline). Question: Is the fly fishing retreat predictive of significant increases in positive mood states? MANOVA on positive moods (serenity, self assuredness, joviality, and general positive affect), F(8, 43) = 24.81, p < .001. Figure 8.0. These findings suggest that participation in the fly fishing retreat was linked to acute increases in sensations of serenity (e.g., calm, relaxed, at ease). 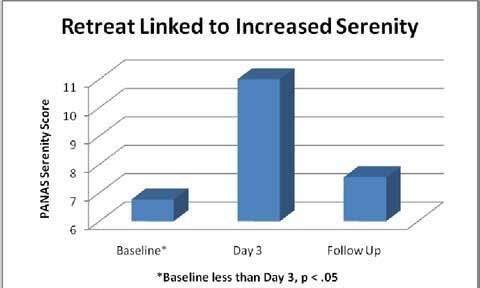 This figure displays significant increases in serenity from the baseline period (M = 6.76, SD = 2.29) to the Day 3 assessment (M = 11.29, SD = 2.83), representing a 67% increase from baseline. Figure 9.0. 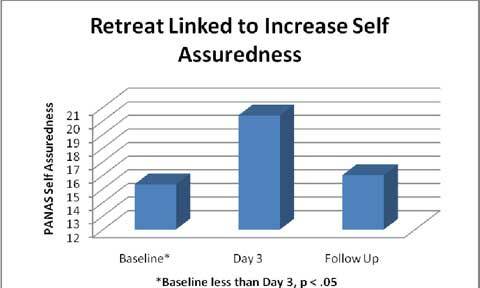 Similar to the effects for the PANAS Serenity subscale, these findings suggest that the fly fishing retreat was also linked to significant increases in feelings of self assuredness (e.g., bold, confident, daring) from baseline (M = 15.31, SD = 4.3) to Day 3 (M = 20.39, SD = 4.52), representing a 33% increase from baseline. Figure 10.0. Significant increases in Joviality (e.g., happy, enthusiastic, cheerful) between baseline (M = 17.82, SD = 6.24) and Day 3 (M = 29.88, SD = 6.58), representing a 67% increase from baseline. Figure 11.0. Significant increase in PA from baseline (M = 25.29, SD = 6.46) to Day 3 (M = 37.1, SD = 6.66), representing a 47% increase from baseline. These findings suggest that the fly fishing intervention is effective at improving mood states at an acute level. Participants also underwent repeated physiological assessments of stress responding during the fly fishing retreat via sampling of salivary cortisol, urinary catecholamines (e.g., epinephrine and norepinephrine) and immune function (salivary immunoglobulins). 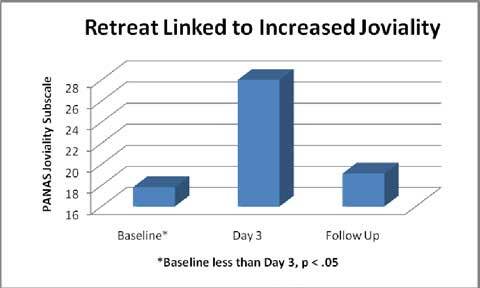 It was hypothesized that retreat participants would display significant reductions in stress hormone responding (e.g., lower cortisol responses throughout the day) and improved immune function (e.g., increases in salivary immunoglobulins). 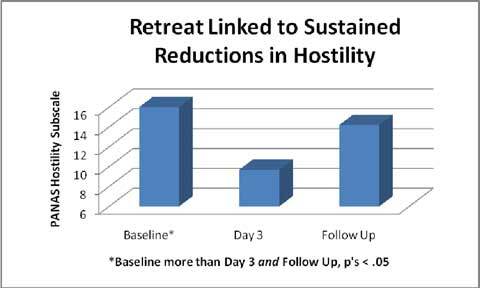 Our findings from a pilot study which took place in the summer of 2009 and involving 23 combat vets suggested that the retreat experience was linked to a significant reduction in daily cortisol production via a comparison made between the first and second days fly fishing, attesting to the calming effects of the trip as a whole. However, we were unable to replicate this finding in the current, larger dataset. Moreover, our analyses pertaining to urinary catecholamines and salivary immunoglobulins were nonsignificant. To date, we have been restricted to physiological assessments taking place during the fly fishing trip itself. Given the demonstrated and replicated findings pertaining to the psychosocial assessments, it is evident that this mode of outdoor recreation therapy predicts significant and sustained improvements in psychosocial wellness. We seek to test these effects more rigorously by implementing a randomized control group design with physiological assessments taking place at the time periods corresponding to the psychosocial assessments, at baseline, last day of excursion, and follow up. It is likely a necessity to extend our timing of physiological assessments in this way in order to obtain a meaningful baseline comparison for these important physiological measurements of stress and immune function.